Riot Fest may end at 10:00 p.m. each night, but we know that this is when the night’s just getting started for so many of you miscreants and ne’er-do-wells out there. For those who need more once the roadies start packing up the headliners’ gear, we present this year’s slate of epic Riot Fest Late Night shows. Direct Hit! and the Bombpops kick off Riot Fest weekend Thursday night with a free in-store party at the Chrome Hub (which is Chrome Industries’ Wicker Park storefront). 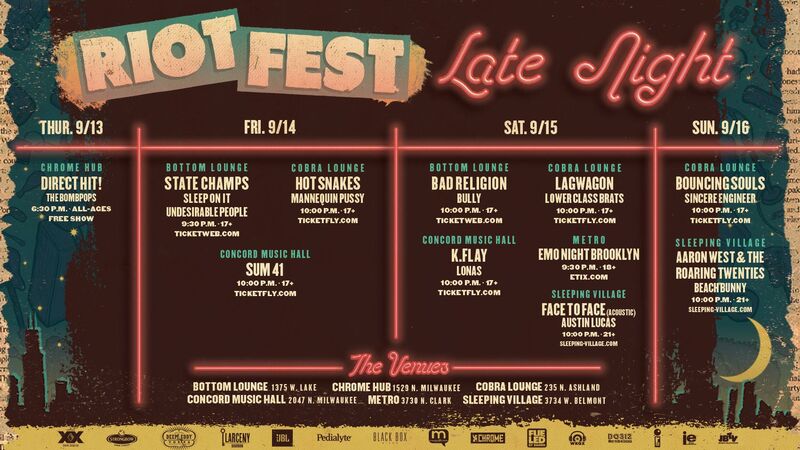 Then on Friday, in addition to Hot Snakes turning Cobra Lounge into a sweat lodge and Sum 41 packing Concord Music Hall, you’ll have the opportunity to catch some bands not on this year’s festival lineup – State Champs, Sleep On It, and Undesirable People – at Bottom Lounge. Saturday night gives you the rare opportunity to experience Bad Religion, Lagwagon, and Face To Face in small clubs, as well as K.Flay at Concord Music Hall and a special edition of Emo Night Brooklyn at Metro. Closing out Riot Fest weekend in style is the Bouncing Souls’ not-to-be-missed Cobra Lounge gig, as well as the Wonder Years’ side project Aaron West & the Roaring Twenties at Sleeping Village. Tickets for all Riot Fest Late Night shows are on sale now. BOTTOM LOUNGE • 1375 W. Lake St.
CHROME HUB • 1529 N. Milwaukee Ave.
COBRA LOUNGE • 235 N. Ashland Ave.
CONCORD MUSIC HALL • 2047 N. Milwaukee Ave.
METRO • 3730 N. Clark St.
SLEEPING VILLAGE • 3734 W. Belmont Ave.